Fourth Row Center: Film Writings by Jason Bailey: In Theaters: "Win Win"
Thomas McCarthy’s films play in such a deliberately minor key, there is a danger—as you’re watching them, anyway—of them flitting off into the ether. They dwell at an intersection of quiet drama and character comedy, easygoing and naturalistic, frequently amusing but short on big laughs (or the easy punch lines those big laughs so often require). It is always in retrospect that they gain they power; it’s not until a few hours or days or even weeks later that you realize you’re still thinking about the characters in a film like The Station Agent or The Visitor . That’s how he works on you. His pictures operate at a slow boil. His latest film, Win Win, begins as a depiction of uneventful suburban life, with the symbolic opening action of attorney Mike Flaherty (Paul Giamatti), out for a morning jog, getting absolutely dusted by a couple of fitter runners. In response, he just stops—he gives up. He’s not sure how to deal with the situation, or most anything in his life: his law practice is struggling, the building he shares with CPA Stephen Vigman (the invaluable Jeffrey Tambor) is falling apart, and he’s got a family to support. His wife Jackie (Amy Ryan) is kind to him, but she has no idea what kind of trouble they’re in. In desperation, Mike comes up with a scheme to take on guardianship of a rich client (Burt Young), putting him in a senior care facility and pocketing the monthly payment from the state. He doesn’t feel good about it, but it solves his problems for a while—until the old man’s grandson Kyle (Alex Shaffer) shows up. His mom (Melanie Lynskey) sent him to live with his grandfather; she’s gone into rehab for a few weeks. Mike and Jackie take the kid in, and then Mike makes a happy discovery: the kid is a champion wrestler. 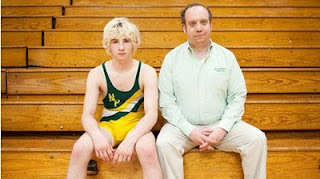 Mike just so happens to coach wrestling at the high school. The outcomes are pretty easy to guess at (though McCarthy thankfully throws a few curveballs, if I may mix my sports metaphors), and if Win Win has a major flaw, it’s that the third act gets a little predictable and a little pat. But this is a film that is less about plot than mood—and performance. McCarthy’s cast is packed deep with fine character actors (he’s one himself): the great Margo Martindale pops in, as does Bobby Canavale, who develops an oddball comic persona that puts a nice spring into the picture (Tambor’s deadpan reactions to him provide some of the most amusing moments). Lynskey isn’t doing any of the obvious moves for this kind of character, but she’s absolutely believable—the reformed mother, trying to be strong, trying a little too hard to connect. Ryan is tough and funny (“It’s not my fault if I punch her,” she warns, when they’re about to meet Kyle’s mom), and nobody on this earth does quiet desperation like Paul Giamatti, who turns a snuck smoke behind a convenience store into a little aria of anguish. The key to the film, though, is Shaffer, a wry young actor with a marvelously dry way with a line. It’s somewhat masterful, how slowly and deliberately McCarthy lets us in; we don’t know who the hell this kid is, what his story is, and it has to be coaxed out of him (and the script). And that is the thread between McCarthy’s films—in some way, they’re all about unlocking the mystery of a unique character, and how that process of discovery affects the one figuring them out. It must be noted that Shaffer’s range is a bit limited—as good as he is in the early scenes, he can’t quite pull off some of the big emotional beats later on. And a couple of those scenes are fairly undercooked, though for the most part, McCarthy’s writing is crisp and lean, and he gets extra points for dodging the dull climax the story seems to be careening towards, in favor of a muted conclusion that couldn’t be more right. Win Win builds, slowly but surely, into a sturdy, likeable movie—small in scale, warm in tone. "Win Win" opens tomorrow in limited release.